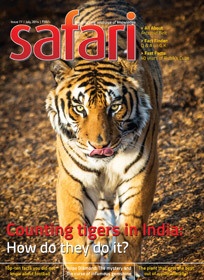 The september 2014 issue of Safari – a knowledge and science oriented magazine from India – is out quite on time. Here are our personal views and reviews about the same. Before we move ahead, it is worth to note that: there are a very few magazines we came across which offers a quality reading material. 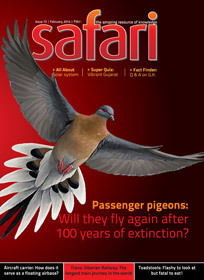 Safari – a science and knowledge magazine is one of them. Owls are not much talked about birds, especially in the context of lovely birds or the birds people like to have as pet. Actually the life-style (or daily routine) of an owl have a lot to do with it. It is considered as to be in almost contrast to our (human) routine. They awake and wanders at night and sleeps during the day. And it makes it mysterious creature! You can find references of owl in ghost stories, paranormal tales and magic books, mainly due to this reason. 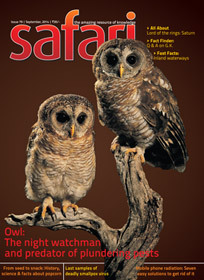 The cover page of this issue showing the photograph of two owls promises an interesting article about “owls”. The creature is recently talked a lot due phenomenally successful “Harry Potter” books. The article by Sushil Bhatia is spread over six pages with one full page containing a large photo of an owl. And the article is having around 6 more photos embedded. The photos/images adds to the article and makes is easy to catch the details mentioned. The article tries to take a look at an owl as a night-watchman. To be more precise the article explores the role of an army of owls in controlling the plague spreading rats! Now that makes it an interesting take. The article is definitely worth reading. The inside cover page brings a high resolution photograph of Pohutu Geyser from New Zealand. The brief description along with the photo tells a lot. It is informative. We always wonder that why this magazine doesn’t have the “editorial” in its English edition! The FYI section tries to bring answers to some questions / brings information about some interesting facts in the form of one page articles. One such article talks about the birds who need to do seasonal migration from one land to other. It is a well known fact that there are several birds who need to go to even different continent on specific season changes. It is definitely wondering a majority of people that how can a bird fly for so long, continuously, without sleep? The article tries to answer in simple words and keep you desired to know more about the same. Despite of visible effects of Global warming and other environment related issues, we are still cutting the jungles and trees with a very high rate! An interesting study about the same is there, in quite statistical manner. It is worth reading. The people who are reading knowledge oriented articles are aware with the fact that the North pole keeps shifting its place! Do you want to know where it is today? A small yet informative article shows it with an image. Sometimes we got used to with several things that we even stop noticing them. But, they are quite an aid to our life style. Take examples of rubber band, staple pin, comb etc. Zip Chain is also one such discovery. You shouldn’t skip reading a small article about it. All of us love to eat pop-corn right? (well, majority of). A three page article by Sushil Bhatia brings some unknown and few known facts about this snack in really “good-to-read” manner. Good to go for. Those who love to read about mysterious or interesting incidents will find the “salt rain in Venezuela” article a good read. Do you know about the – frog jumping competition? Well, there are quite different kind of activities takes place in the world we may find amusing, and it is one such. The article about it however doesn’t talk about the event only, but tries to explore the science behind the jumping skill of a frog. And, it makes the article interesting and worth to read. The – Fast Facts – segment tries looking at the Nationwide network of inland waterways in India. It tries to summarise the information about the same in some other countries as well. It is a good article in summarised format, thought it makes you feel that you need much more information and it should be a full length article. Mobile phone radiation – is a – much talked about – issue these days. A lot of people don’t know what exactly it is, and how much dangerous actually it is. There is one article written about it in this issue which is spread over 5 pages. The language of the article is simple and it is having images/photographs added, where needed. It is not-to-miss article for everyone as it talks about some ways to – get rid of it! Is it worth to keep them if we actually got rid of it? What if they are spread from the samples kept, due to any natural or human caused disaster? Won’t they themselves be the cause of another havoc? The article though talks even the history of the virus and its usage in war and other aspects in detail as well. The article tries not to show any conclusion but just explores the facts found. It is not-to-miss article. The – Q & A : Fact Finder – section brings the answers to the following questions and you may find it interesting based on your interest in the question itself. If the red giant star Betelgeuse explodes as a supernova in the future, will there be any threat to life on Earth due to its radiation? Is it a fact that the hair and nails continue to grow even after death? What is German people’s perception towards Adolf Hitler today? Why is that the tail of a whale is horizontal and not vertical like that of shark and other fish? How is data stored in a pen drive? What is the total area of forest cover in India? Smart phone’s screen rotates automatically to orient itself vertically, regardless of how we hold the device. What is the technology behind this? The word population has crossed the figure of 7 billion, while the land area of our Earth remains the same. With the present population, what is the share of land area available to each person? Why do SIM cards have a unique cut shape? How many countries are still ruled by Kings / Queens? India has recently developed “Shaurya” missile, which is said to be different from other missiles. How is it different? Which animal possesses the heaviest brain? How much quantity of salt is dissolved in all the oceans of the world? The last cover page contains a very detailed – All About – article for the planet Saturn. It is very interesting for those who are interested in studies of such planets. Overall a very balanced issue, which is worth reading. It is definitely a good choice for knowledge seekers and it gives you back (in terms of worthy knowledge) for the time and money you spent for it.